For those of us who are concerned with blue light eye damage, you will be interested in my efforts to eliminate this source of eye injury. If you’re looking for a scientific explanation of the damage that can occur from blue light well, sorry, but you’ll have to go elsewhere. I read about it but am definitely not equipped to explain what I read. What I do know is that blue light is especially bad for eyes that have had cataract surgery (me) and children (definitely not me :-) Kids’ eyes are still developing and natural lenses have some – not much – resistance to blue light whereas current cataract lenses allow the blue light directly into the eyes. I noticed that at night my eyes would be extremely tired, often burning. It was so bad that sometimes I couldn’t read. So after some research I decided to experiment with ways to cut down the strain and blue light and see what happened. #1: The first thing I did – and the most effective – was to buy a new monitor. The monitor I had still allowed ‘flickering’, even though the human eye can’t detect that. 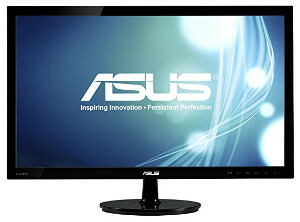 I bought an ASUS HDMI monitor which will filter up to 70% of all blue light and doesn’t flicker. I generally leave my monitor at 50% filtration. The stronger the filter, the greener my monitor image becomes and 70% is unacceptable to me. I turn it off at times when I’m doing my graphic design because the colors aren’t as “true”, but most of the time I have it on. A note about the blue light apps: according to researchers, they’re ineffective. And I tried one out and it didn’t help at all. I doubt if you’re getting much protection although they must be better than nothing? #2: I put a filter on my tablet. It’s just a small thing and I don’t imagine it’s that useful, but it can’t hurt. #3: If you’re looking for the best blue light blocking glasses you need to talk to someone else. I ordered a pair off Amazon and they were definitely not the cheapest ones and they had lots of positive reviews. I put them on and in less than five minutes I had a return authorization and they went in the mail that afternoon. As I wrote the seller, “I HATE these glasses”. I wasn’t being mean to the seller, just stating my opinion of the horrid things. They made the entire world a bright yellow! A glaring yellow. I found a pair in a store later that week and they were the same. I know some people wear yellow sunglasses by choice so perhaps you won’t be bothered by this, and most Amazon reviewers seemed OK with it, but I do want you to know what to expect. #4: My last effort is to start taking lutein. The definition of lutein is, “Lutein is a xanthophyll and one of 600 known naturally occurring carotenoids. Lutein is synthesized only by plants and like other xanthophylls is found in high quantities in green leafy vegetables such as spinach, kale and yellow carrots.” I bought 120 pills and since I take only one per day that will give me a four month trial and then I can decide if there is any benefit. Results so far: from the very first all-day usage of my new monitor, my sight has drastically improved. No more burning, no eye fatigue and there is the reassurance that my eyes are less likely to be damaged by blue light. Keep in mind that the lack of flickering may also be a cause of this substantial improvement. Whatever the reason, I am decidedly grateful.